The half-pass is not a trick. It is a skilled movement that requires the horse to have the proper muscle development and agility. Training half-pass too early can be a disaster for you and your horse, setting back your horse's training and your riding skills. Do yourself and your horse a favor: Don't skip the steps. Your should also have a "feeling awareness" of which hind leg is lifting as the horse walks, trots, and canters. The reason for this is that you will need to use your leg aids to assist the horse in bringing his inside hind leg under his belly, and you can only influence a hind leg when it is lifting off the ground. (For more about how to develop this awareness, see my article on leg yielding.) Your horse should also be familiar with how to ride shoulder-in, and most importantly, she must know how to execute the perfect travers (haunches-in). When riding a half-pass, you put your horse in this position and allow her travel diagonally across the arena instead of forward along the rail. This can be done in trot or in canter. Your horse must be collected to do this movement accurately. It's easiest to start with a small circle (ten meters is ideal) in the corner, and then maintain the bend as you take a few steps down the rail. Now you want your horse to move off the rail on a diagonal, and travel across the arena. To do this, you use your inside rein and inside leg to maintain the bend. 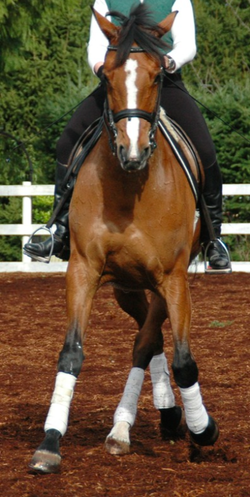 Your inside rein can be used as a leading rein to gently guide the horse on the diagonal. The outside leg is applied behind the girth to direct the hind leg onto the diagonal line. Your outside rein controls the outside shoulder so the the neck does not over-bend. Two things to keep in mind: Always think "forward and sideways", not "sideways". If you're totally focused on going sideways, you will lose the entire movement. The second is that you have to be able to VISUALIZE the diagonal line of travel. If this is not clear in your mind, you will lose momentum and clarity of movement, ending up fishtailing through the arena rather than traveling on a clear, crisp diagonal line. In this very brief video clip, Jody Hartstone, Grand Prix, dressage rider and Equitation Science does a wonderful job in breaking down the components of travers and half pass in walk. You can clearly see what she is doing as she describes the aids. In this lovely video from Dressage Hub, the rider clearly shows you the difference between leg yield and half pass, and how to use leg yield as a correction if things go wrong. She also shows some of the common problems and errors that crop up when training half pass. And in this excellent three minute video, Grand Prix rider Gareth Hughes shows how to do half pass in canter. This video includes slow motion so you can see exactly what is going on. Notice the use of the driving leg behind the girth. More information and exercises for training half pass can be found at USDF by clicking here. Here are some books, videos, and products I recommend to improve your riding.